The Google Pixel 2, or its larger sibling, the Pixel XL 2, is one of the best phones you can purchase right now. Available through Verizon and Google, it’s the latest and greatest in Android and features some pretty damn impressive hardware. It’s one of our favorite devices ever, even if it’s not exactly the sexiest device on the market. One of the things we love about Android is that it offers so much customization. The platform continues to get better all the time and the 8.0 Oreo release is as gorgeous as it is practical. Spend any time with either phone and you’ll no doubt realize there’s a world of potential at your fingertips. READ: Want Android P? Here’s how to get it on your device today! Whether this is your first Android phone, first Google handset, or just the most recent in a long history of upgrades, you’ll want to set it up to your liking. We’ve gathered up a handful of helpful tricks, tweaks, and tips to ensure you get the most out of the phone. Here are ten Pixel 2 settings you should know. One of the features that Google was quick to highlight for its 2017 flagship phone, Active Edge, gives users the ability to squeeze the sides of their phone to trigger Google Assistant. While we were initially reluctant to buy into the hype, it’s one option we find ourselves using regularly. But, that doesn’t mean this is something that everyone loves. Here’s how to tailor or disable Active Edge. Navigate to SETTINGS > SYSTEM > GESTURES > ACTIVE EDGE. From here you can configure the sensitivity of the squeeze gesture. 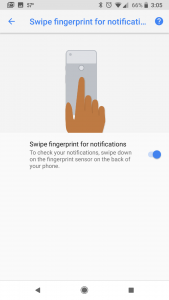 Moreover, you can also opt in and out of allowing it to trigger when the screen is off or if you would like for squeezing to silence alarms, timers, and incoming calls. And, if you just don’t want to use it at all, simply toggle the first option “Squeeze for your Assistant”. Perhaps the one feature we’ve come to love more than most, we love the ability to swipe the fingerprint reader to check notifications. Yes, you can simply slide your finger down the reader and your notification shade will slide down on the screen. It’s a dead simple way to take a quick peek at your unread messages, status updates, missed calls, and more. For whatever reason this is not turned on by default. Not to worry, though, you can set this up at SETTINGS > SYSTEM > GESTURES > SWIPE FINGERPRINT FOR NOTIFICATIONS. That’s it! While it might not sound like much, this is a highly underrated way to mange your Pixel 2. One of the features we liked best about the first Pixel is the ability to lift to check our phone for time and notifications. 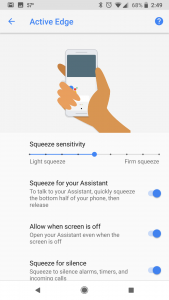 While it’s present in the Pixel 2, it’s not enabled by default. To turn this setting on, navigate to SETTINGS > DISPLAY > ADVANCED > AMBIENT DISPLAY. From there you’ll want to enable the “Always On” which triggers the ‘Lift to check phone’. Now you can simply lift your phone up to wake it, showing your messages, missed calls, and more. You can also decide at this screen whether you want the option to double-tap the display to check the phone. Although the phone doesn’t come with quite the color customization as what Samsung or LG might do for their respective phones, there is one noteworthy Pixel 2 setting. If you want your pictures, video, and graphics to leap off the display just a little differently, you can choose from different modes. Head to SETTINGS > DISPLAY > ADVANCED > COLORS and choose from Natural, Boosted, and Saturated. Pick one and play around with it for some time to decide if you like it. Or, change it when you’re playing a video game. One thing we often take for granted is the ability to change simple things like the wallpaper. It’s easily one of the quickest ways to make a phone feel like it’s “ours” and unique. The Pixel 2 gives owners a whole host of options in the area of preset wallpapers, each of which can help make the handset feel special. 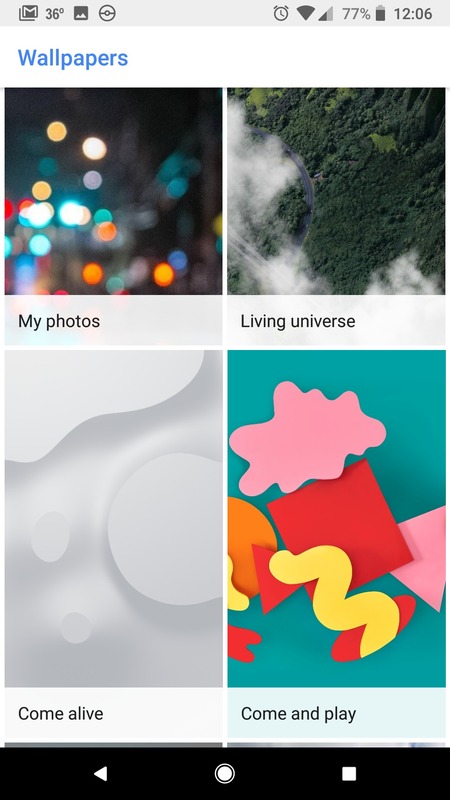 Two of the things that really stand out for the Pixel 2’s background are the Living Universe and Come Alive sections. The former are stunning photos that have an ever-so-slight movement to them. Look closely and you’ll see in one that the waves are crashing on the beach; in another cars are driving on the highway and the clouds are drifting by. As for the Come Alive, these are similar to the “Live” wallpaper that’s been around for years, but with a twist. Some move and react to tapping and swiping while others change based on time of day or battery percentage. To change your wallpaper you can long-press the home screen and tap the appropriate icon. You’ll find that, in addition to these two types of wallpapers, the Pixel 2 has a wide variety of stock images, too. As much as we like keeping our notification bar clean, sometimes it’s tough to tell how much battery you have left. Instead of relying on the battery symbol and guessing, have your phone tell you exactly what percentage you have to use. This one’s accessible through SETTINGS > BATTERY where you’ll trigger the slide for showing percentage. There, isn’t that better? Have you noticed those little colored dots on some of your icons? Whether on the home screen or in your app drawer, these dots are there to signal a notification. Your Gmail one, for instance, might have one for an unread message. The Play Store might show one when you have apps that need to be updated. A lot of the apps and games you have on your phone will give you notifications to varying degrees. And, while some of us prefer the unobtrusive indicators, others don’t want to look at them. They are, after all, just the same stuff that’s in the top bar on your phone. 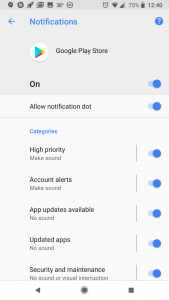 The Pixel 2, and Android 8.0 Oreo, gives users the ability to manually select which apps can show those notifications. So, rather than turning them off completely, maybe you just want Instagram or Facebook to stop telling you every time someone leaves a comment. Navigate to SETTINGS > APPS & NOTIFICATIONS > NOTIFICATIONS and you’ll have a screen with a few user-defined options. You can turn all of the notification dots off at once by toggling the setting here. But, if you tap the “App Notifications” at the top, you can select a specific app and its settings. It’s in each app that you can disable the notification dot. While we spend most of our time staring at our phones in portrait orientation, sometimes we we end up turning the phone sideways in landscape. Maybe it’s for a video, maybe it’s to look at pics, or maybe it’s just the way you like things. 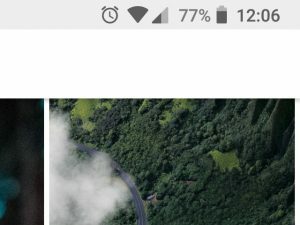 Did you know you could also do that to the home screen of the Pixel 2? To enable this setting, just long press the home screen and tap the HOME SETTINGS gear. The screen that pops up gives you control over the main screen rotation as well as other options. Note that by allowing the rotation you will lose the pervasive search bar that’s found near your app drawer. 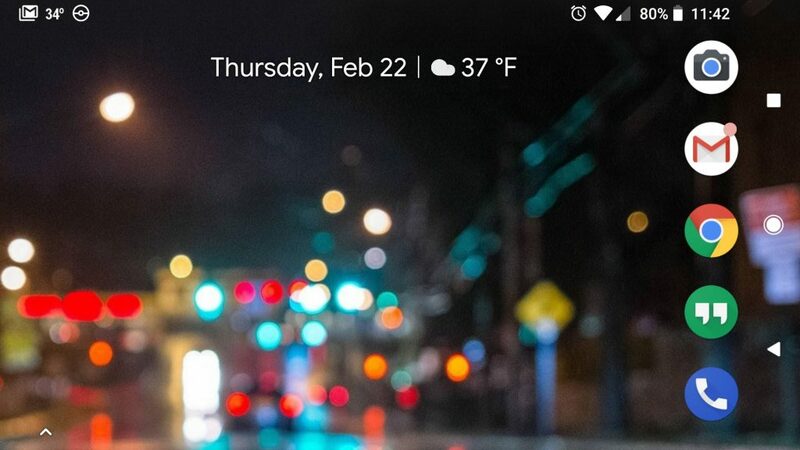 See that date and weather that’s showing at the top of your home screen? That will show you your next calendar appointment as well as any relevant traffic information. Should something unusual happen to affect your commute you’ll know from a quick look at the home screen. It’s handy stuff to be sure, but you don’t have to see it if you don’t want to. Long-press on the home screen widget and you’ll see a pop-up for preferences. You can choose to disable calendar events or traffic information. 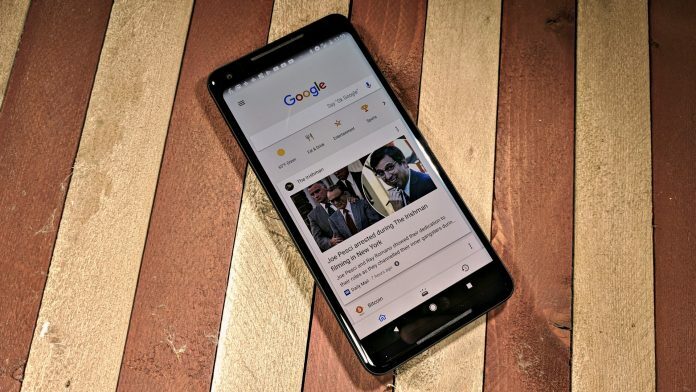 If you’re the type of person who loves to tailor the Google experience around your preferences, chances are good you’ve set up news and interest preferences. Swiping to the left screen gives you all of the most relevant news and weather. Great stuff if you use it. For those who don’t want that screen to show up, or for those who just don’t care about the customized experience, you can get rid of it. Like the home screen rotation setting, this one’s accessed by long-pressing the home screen. Tap the HOME SETTINGS gear and slide off the “Display Google app” option.